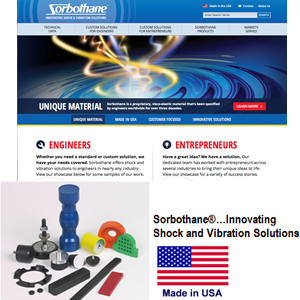 Kent, Ohio - To us, Sorbothane® has always been more than just a name or material. Sure, it has a number of amazing characteristics, but those characteristics make it what it truly is – an innovative solution to some very interesting problems. Because of Sorbothane®, a man climbed Mount Kilimanjaro, a young ice skater developed a pad to protect athletes from harmful impact shock and the Liberty Bell made a trek to the Philadelphia Museum of Art with its historic crack unchanged and fully intact. These are just a handful of Sorbothane® success stories, but they keep piling up. As a result, a new kind of problem came to our attention: How do we tell that part of the Sorbothane® story? How do we show what Sorbothane® truly is? We've highlighted a few of our numerous case studies in our solutions showcases of Engineers and Entrepreneurs to demonstrate how we were able to partner with large companies and even single individuals to provide innovative and customized solutions to complicated design and development problems. We've made forms and downloadable materials easier to find and use. You can find the Standard Product Guide and the Engineering Design Guide more easily than before. Our website embraces the use of a responsive design framework, making it easier for you to find the information you want on a smartphone, tablet or any other device. In addition with providing you with numerous ways to get to the content you need, we've simplified our main navigation so you can find higher-level items faster. We're proud to say our innovative, custom, creative new website is ready to show the world how innovative, custom and creative our Sorbothane® solutions can be, and we're extremely excited to add more chapters to this particular part of our story.